The Ferguson F101HDSat Freesat HD zapper is pretty much a clone of the Metronic Sat HD 100. Both have the benefit of media playback from USB drives but lack BBC iPlayer – with no signs that it will be added. 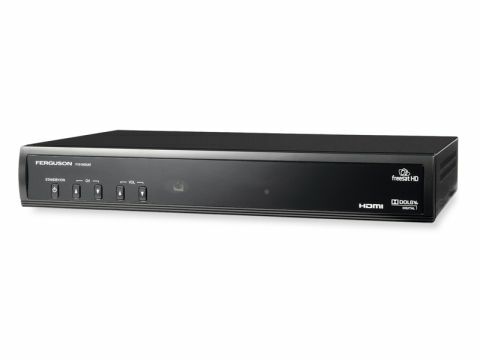 Like the Sat HD 100, the receiver is heavy and runs rather hot. Power, channel-changing, and volume buttons make up a plain fascia. The rear features an LNB loopthrough, an HDMI out, TV and VCR Scarts, an optical S/PDIF and Ethernet and USB ports. The remote's buttons are small, but there are VCR-style pads for controlling music and video. There are two tuning modes – Freesat and manual. Freesat tuning involves the usual process of punching in your postcode to determine which regional variations of ITV and BBC occupy the top slots in the EPG before scanning. 'Manual' can be used to receive non-Freesat channels from 28.2°E or other satellites in range of your dish. You can scan a single satellite (a full scan of 28.2°E took 20 minutes), scan a transponder or perform an NIT scan, but there's no support for advanced features such as DiSEqC. If you do a manual scan of 28.2°E you get Freesat and more channels but you can't switch across to the Freesat EPG. Instead, all channels get a more basic guide listing DVB data for the current channel. Channels (Freesat or otherwise) can be sorted A-Z, Z-A into SD and HD channels, by network or grouped into lists headed movie, music, sports, shopping, guide, news, scramble, FTA or Favourites 1 or 2. Perform a Freesat scan and you get a rather low-res version of the standard Freesat EPG – viewable as a full-screen grid for all channels, skippable in 24-hour periods with synopses included. This can be further sorted into 12 genres (e.g. news) and you can schedule up to eight timer events with once, daily and weekly repeat options. Format support for media playback from USB drives is limited to MP3, JPEG (with slideshows) and MPEG-2 files and there's no provision for playlisting. Both HD and SD pictures look reasonably crisp using the HDMI output, but SD Scart pictures can leave colours looking pale and unnatural, even with RGB enabled. The FD101HDSAT isn't great for those who want other channels but it just about passes muster for a Freesat HD zapper.